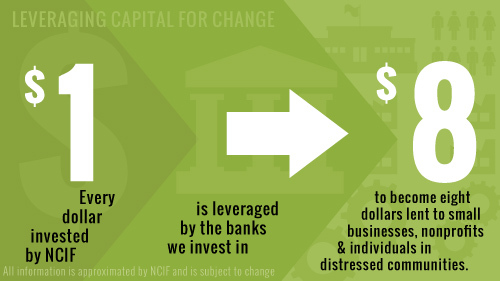 NCIF uses the incredible power of mission-oriented financial institutions to transform low-income communities. As NCIF has grown and evolved, we plan to invest and lend to selective banks and non-bank companies that can increase capital in underserved areas naturally. The following is a cumulative list of NCIF Investees since inception. Through the work of these institutions, NCIF helps transform low-income communities. DDI: % of a bank’s branches located in low- and moderate-income communities. DLI-HMDA: % a bank’s HMDA-reported lending occurring in low- and moderate-income areas. All information is based on annual HMDA data (ffiec.gov), Census data, and annual Summary of Deposits data (fdic.gov), and Statistics on Depository Institutions (fdic.gov) as well as private reporting from banks where appropriate. DLI-HMDA and DDI are as of 2014. Financial data is as of 12/31/2015. All information is gathered from or calculated using publicly available data. NCIF is not responsible for any inaccuracy.